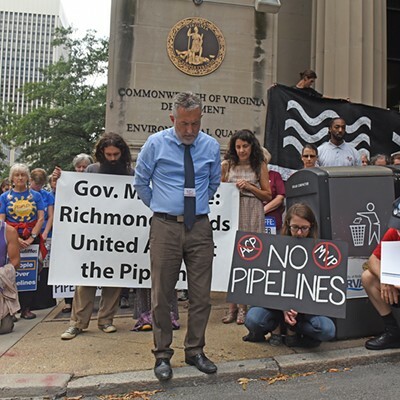 Richmond Pipeline Protest Results in 19 Arrests | News and Features | Style Weekly - Richmond, VA local news, arts, and events. Scott Elmquist Pam Tinker is arrested during a protest by anti-pipeline activists on Thursday, Sept. 14. 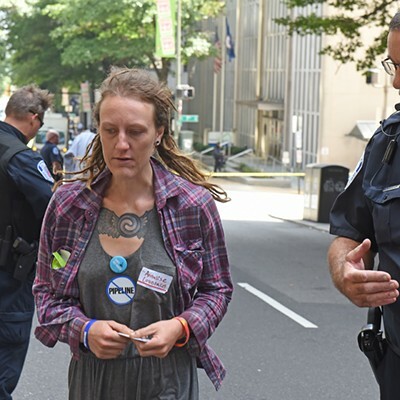 Police arrested 19 activists today at a demonstration in downtown Richmond. 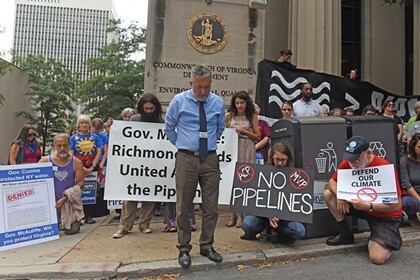 They were protesting the construction of the Atlantic Coast and the Mountain Valley pipelines, which are currently being considered by the Virginia Department of Environmental Quality. 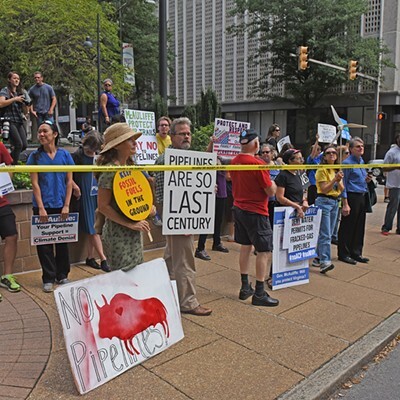 “We can’t spend billions of dollars to strip property rights from landowners to build pipelines at a time when we desperately need to reduce greenhouse gas emissions,” said Jamshid Bakhtiari, the field coordinator for Chesapeake Climate Action Network and its Action Fund. 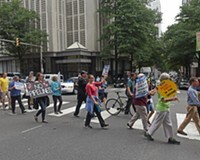 The organizations teamed with two dozen other environmental groups to stage simultaneous protests at seven department buildings around the state. Richmond’s demonstration was the only one where arrests occurred. 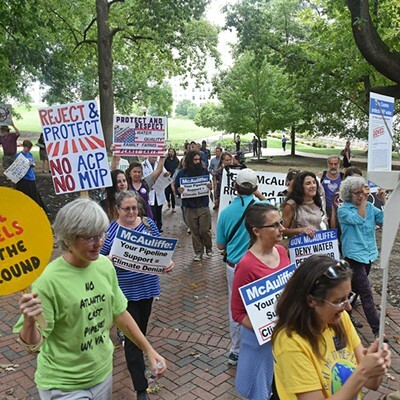 Bakhtiari started the event on the Virginia State Capitol grounds where a group of about 30 protesters gathered, gave speeches and then eventually marched five blocks through downtown Richmond before stopping at the department headquarters at Main and Seventh streets. “Every DEQ office across the state needs to know we want them to do their job,” said Anne Havemann, legal counsel for the network. She corresponded with police departments at each of the protests to make sure the events unfolded safely and in an organized fashion. Capt. John O’Kleasky, commander of the Special Operations Division for Richmond police, said they were happy to offer support for the group and thanked them for coordinating ahead of time. 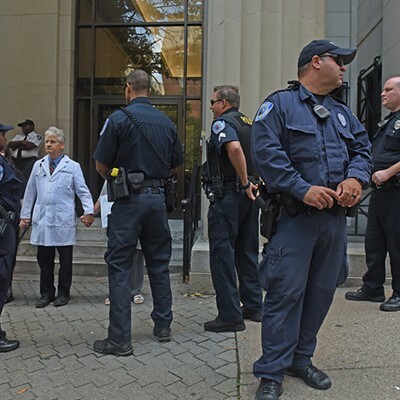 As the anti-pipeline protesters had planned, after about an hour blocking the path to the headquarters, 19 activists locked hands as they were individually taken aside by city police and given summons for “obstructing free passage,” a class one misdemeanor. 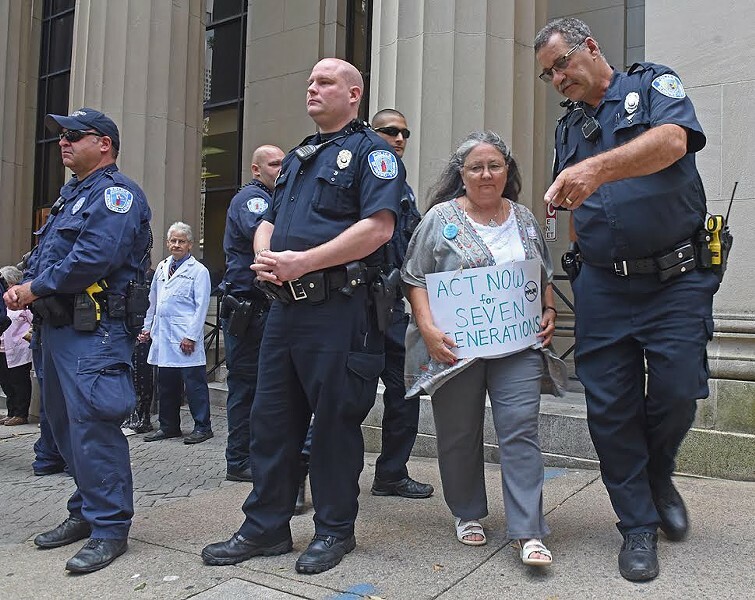 Among those who were arrested was Donna Shaunesey, a 68-year-old Charlottesville woman who drove to Richmond to get arrested as part of today’s event. This was Shaunesey’s first arrest in relation to activism, itself only a year-old venture for the retiree. She said the time she’s spent paddling down the James River inspired her to participate in anyway she could. In a statement sent to Style, a Dominion Energy spokesman called the Atlantic Coast Pipeline one of the “most important infrastructure projects in our region’s history” and said it will provide cleaner energy for millions of Virginians. 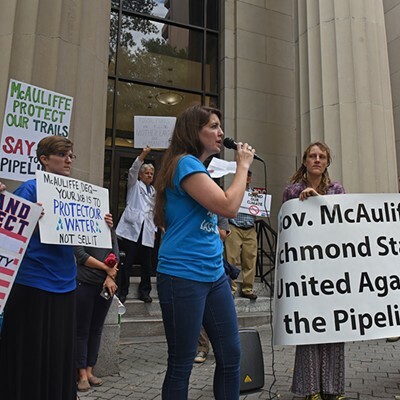 Pushes against pipelines across Virginia have been around for a few years but were thrust into the spotlight during the Democratic gubernatorial primary race in which the losing candidate, Tom Perriello, promised to end the project if elected. State Lt. Gov. 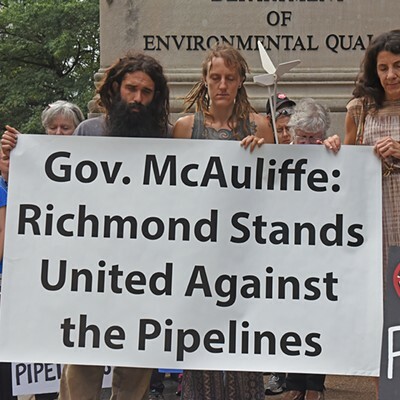 Ralph Northam, who won the primary and is set to face Republican Ed Gillespie in November, has promised a thorough review process for the construction of the pipelines, but has otherwise expressed support for them because of the economic benefit it could bring Virginia. Gillespie has also supported the project and similarly praised the possible economic impact from their construction. Still, recent action by Gov. Andrew Cuomo of New York has given hope to anti-pipeline advocates. He used a section of the Clean Water Act to block a proposed pipeline in the Empire State earlier this year and has been hailed for it by environmentalists. No matter who wins the governor’s race, Peter Macdowell hopes he will take steps to shut the pipeline down like Cuomo has. 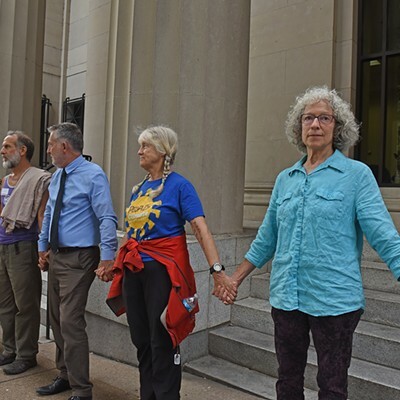 “The dots are just too damn obvious not to connect,” said the 75-year-old lifelong activist, standing proudly with his Richmond Circuit Court summons blowing in the wind. This wasn’t his first arrest. 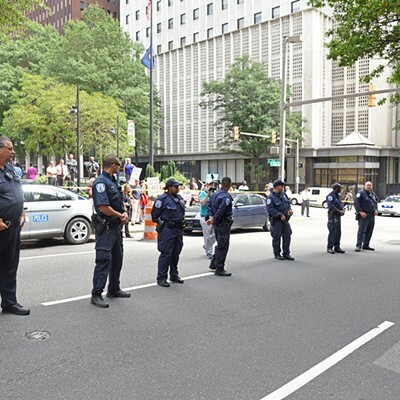 He skipped the protest closer to his home in Alexandria because he wanted to take part in the civil disobedience, and arrests, happening in Richmond. And while he supported and volunteered for Perriello during the primary this past summer, he’s hopefully at least Northam, if he wins, will change his mind.